The crazy kids over at iSoftBet have brought John Rambo into the realm of online pokies to great effect. Rambo, the online slots game itself is solely based on the 2008 movie, simply called Rambo. The world was first introduced to shell-shocked Vietnam veteran, John Rambo, in David Morell’s 1972 novel First Blood. The book was then brought to life for the big screen with Sylvester Stallone playing Rambo in 1982’s First Blood. Since then, we have followed Rambo on several epic adventures around the world. He has come to be one of our favourite Vietnam veterans. iSoftBet are beginning to build a reputation for creating unique and fun games as well as producing fantastic online pokies based on popular teevee shows – think Beverley Hills 90210 and 24 – and movies – like Basic Instinct and Platoon. Straight off the bat, the first thing you notice about the Rambo online slot is how it differs from the majority of other games on the market. Where most online pokies you find today are 20, 25 or the very generous 243 ways paylines, Rambo is a five reel 720 payline pokie, which offers even more ways to win big. Rambo is available to play for free or real money. First choose how much you want to wager per spin, with bet sizes ranging from $0.50 to $25.50 per spin. The game has an eerie feel produced by the almost haunting and isolating background sound of soft rain falling in the jungle – it resonated with us in a big way, as massive Rambo film fans. 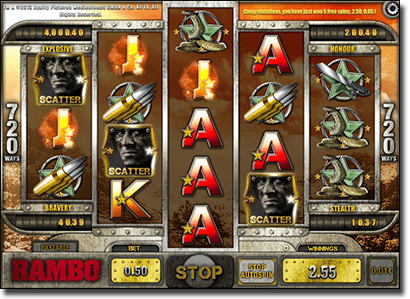 Rambo is a four-tiered progressive jackpot game. Any one of the jackpots can be triggered by any five or more scattered golden grenade symbols on an active reel. The progressive jackpot can even be won during free games. Five golden grenade symbols triggers the “Stealth” jackpot which is the lowest jackpot, currently sitting at $12.07. Six golden grenade symbols triggers the “Bravery” jackpot, currently sitting at $66.08. Seven golden grenade symbols triggers the “Honour” jackpot, currently sitting at $292.42. Eight golden grenade symbols triggers the “Explosive” jackpot, currently sitting at a massive $4,547.76. As with most progressive jackpots, the higher your bet, the higher your chances of spinning up five or more golden grenades to trigger the jackpot. Five free games can be triggered with any three or more scattered John Rambo symbols. Before the five free games begin one symbol is picked at random to be your expanding symbol. That symbol will then expand across that entire reel whenever it appears on the screen during your five free games. The colour of the screen changes and intense music kicks into gear before the free spins commence. Sadly, there is no multiplier during these free games, but it is possible to re-trigger the feature during your five free games. Rambo follows the classic symbols in ascending order: 9, 10, Jack, Queen, King, Ace as well as bullets, a machete, a snake and a military jeep. Any winning combination of three or more bullet, machete, snake or jeep symbols shows a brief clip from the 2008 Rambo movie. The Rambo Wild symbol can appear stacked and substitutes for every symbol except the golden grenade and the John Rambo scattered symbol. iSoftBet have done a fantastic job recreating the Rambo movie and have managed to stay true to the theme of the film and the character himself. The 720 payline format is a refreshing take and something a little off centre and sets itself apart from the vast majority of other online pokies on the market, and allows for stacked symbols and stacked wilds – which is great for the player. This game seems to have been created with the punter in mind, which is great to see. The four-tiered progressive jackpot is a cracking addition which will keep you coming back for more in the hope of winning the “Explosive” jackpot. The only down side is the free games. I would personally either prefer more free games or a multiplier. Aside from that though, Rambo is a rounded game that you can play for hours.